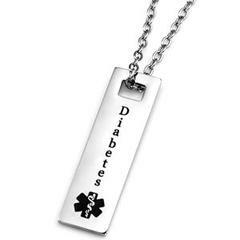 Our Diabetes medical id alert dog tag pendant is made of stainless steel. The back can be engraved with 3 lines of engraving and this comes with a 30 inch stainless steel bead chain which you can easily cut to the size you want.The medical alert pendent measures 1 5/8 x 1/2 Inch. Engraving is done in black laser and no extra cost.